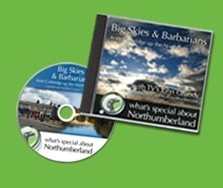 01/12/2018 :: Latest News: Northumberland wins Gold in Tourism Awards So much to see - before and after the Romans! Most widely recognised as presenter of the Tyne Tees TV programme, “Grundy’s Wonders”. John Grundy presented the programme in an enthusiastic way, while covering many aspects of the northern English region's history. This was also one of few architecture series on television. John Grundy features as the guide for all our Northumberland routes.